Retired NYC Police Officer. Retired to Pennsylvania. Always a hot rod buff and builder. Mopar fan since 1975 and owning many muscle cars since. I have restored my 72 Dodge Demon to show quality. 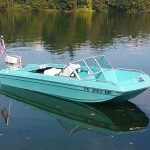 Also restored my 1972 Chrysler Sport Satellite 15′ runabout boat with it’s original Chrysler 55 hp Outboard the same way. Most of my models are all Chrysler products and detailed pretty much to factory stock specs. Awesome projects on this site. I’m gonna love it!